When we opened in 2007, we were Oregon's first Brompton dealer. In a product lineup heavy on very big bikes, the little tiny Brompton seemed an outlier. They fit in some of our bigger bikes' front racks, and on planes, as carry-on luggage. We carried Brompton because our personal experience of them going back to 2000 made us believers. It's a good thing we had that personal commitment as a bolster, because for the first few years we didn't turn much of a profit, especially relative to conventional bikes requiring less suspension of disbelief to buy, or even try. A small number of early adopters told their friends, who told theirs, and so on. A very healthy number of people who rented Bromptons went on to buy them. Every year the product got even better, especially in 2009 with the rollout of wide-range gearing. Some inspirational Brompton stories appeared. And then something happened. 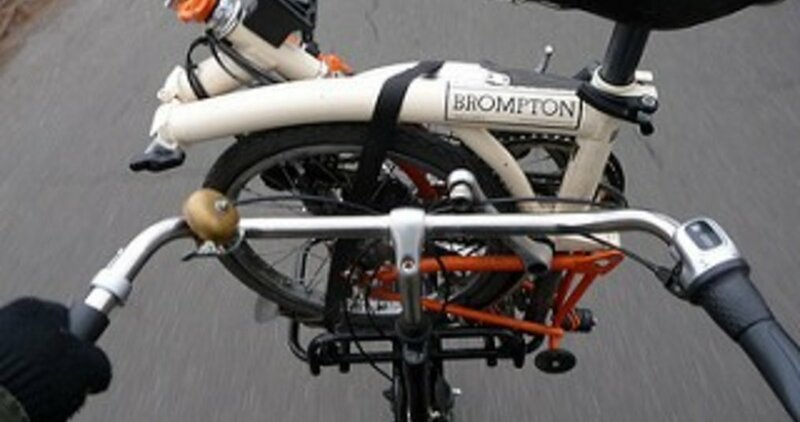 In about 2011, the sales curve of Bromptons came to resemble a hockey stick. BOOM! It seemed like one day to the next, Bromptons stopped being something we had to sell with actual salesmanship, testimony and demonstration, and became something customers walked in announcing they had come to buy. We began to struggle to keep stocks up. We still do. Fine problems to have! Bromptons have since become absolutely crucial to the continued growth of our business, a nice validation of the "do what you love; the money will follow" chestnut. These days we ship quite a few Bromptons outside Portland. They ship easily and cheaply. While that helps us out especially in the slow months, we miss out on meeting our customers, and you miss out on the level of service that we can provide only in person, wrench in hand, with you riding. It still amazes us how profoundly a few fit adjustments and part swaps can make to the feel of Bromptons. Sure there's only one frame size, but the things adjust in saddle heights over a range of almost 18", with cockpit lengths varying over 11"! When we ship a Brompton without benefit of fitting, we just have to hope customers explore the relevant parts of these ranges on their own. Out-of-towners: we invite you to Portland to check out Bromptons (or any bike you're thinking of having us ship). It's is a great place to visit, anytime but especially between May and October. We've partnered with the fantastic RiverPlace Hotel, an easy walk and easier pedal over the Hawthorne Bridge from us, to offer 20% off their best normal rate for your room. Just book online and enter the code "RPC" when making your reservations. Don't rent a car: rent a Brompton while you're here, and if you proceed to buy one we'll comp the cost of the rental, up to $100. Appease your husband's or girlfriend's objections to your bike junket with a romantic dinner or three; we don't have a discount on that lined up, but we can make recommendations.